soy | "blackberry-eating in late September"
It is uncommon for me to champion a dish for being quick and easy, as so few of the recipes I create for you are. But every once in a while, particularly at the beginning of a new semester of school as I re-learn how to do my job and how much time it entails, I have to shift my cooking style a bit – multi-part sandwich experiments just don’t fit into my day. Once in a greater while, a dish that results – like this one – is such a stunner that we have it three times in as many weeks and I know I have to share it with you as soon as possible. This one is everything. I mean, with a claim like “perfect” in the title, it had better be, but trust me. Not only does it take advantage of the late summer green bean harvest, but the ingredient list can almost fit on one hand, and aside from the green beans and citrus (unless you are lucky enough to have a lemon tree nearby), it really is composed of ingredients you probably already have. * Mustard and soy are a dynamite pairing that work well as a marinade for meat too (and tofu and tempeh, for that matter), and the squeeze of lemon right at the end keeps things light despite the short, buttery stir-fry the beans are subjected to. Okay, so there are two cooking methods here. But honestly, each of them only takes 3 minutes at most, and you can prep the beans while the water to blanch them is heating up. One knife, one cutting board, one skillet, one bowl or pie plate, and one pair of tongs. It’s hard to beat that, especially when the result is a pile of snappy, still-crisp beans speckled with a perfectly savory, tangy, just-salty-enough coating that pairs as well with a roast chicken as it does with a sandwich or a bowl of quinoa. * this is a television chef claim that bothers me: while I do usually have things like canned tomatoes and a selection of beans in my pantry, sardines in olive oil, bars of white chocolate, and marsala wine are just not “pantry staple items” that I always have on hand to “throw together” a quick meal (though let’s not pair these particular options – this sounds even worse than a bad Chopped basket). Fill a 12-inch skillet with cold water, add the 1 tablespoon salt, and bring it to a boil over medium-high heat. While the water heats, prep the green beans and whisk the soy sauce and mustard together in a wide, shallow dish – a pie plate works well for this. When the water is boiling, carefully drop in the green beans, stirring to ensure they are all immersed, and cook for about 90 seconds (2 minutes if your green beans are very large). Immediately drain off the water and relocate the beans to the soy and mustard mixture; toss to coat evenly. Place the skillet back over medium-high heat, add the olive oil and the butter, and when the mixture is shimmering, use tongs to add the green beans back into the skillet, shaking them off a bit as you do so to avoid adding excess liquid to the pan. Cook, tossing often, for about 2 minutes, until the beans are well coated with little brown bits. Squeeze in the lemon juice, season with salt and pepper to taste if desired, and cook, tossing frequently, about 1 minute more. As I noted last week, I’ve been out of town. In fact, I’ve been off the continent (though not out of the country). Now that we’re back on the mainland, I suppose I owe you a few reflections. Kauai is beautiful. But if you’ve ever seen Jurassic Park, or Raiders of the Lost Ark, or even the opening sequence of M*A*S*H, you already know that. It’s a tropical island dotted with beaches and rainforests. It couldn’t be anything but beautiful. But what struck me as we wandered, sandal-and-swimsuit-clad, through the little towns and massive resort complexes, was how friendly it was. I don’t just mean ordinary smiling helpful friendliness. That much is expected too, since so much of the island’s industry is built on tourism and the service jobs it requires. I mean food friendliness. Many, many businesses proudly assert themselves as GMO-free. The Kauai Coffee plantation, which we visited one afternoon (photos to follow, I’m sure), is basically off the grid. They are entirely water powered by rainfall and river flow from one of the island’s mountains, and create enough energy to power parts of nearby towns as well, sometimes. It is one of the most sustainable businesses I’ve come across, but they don’t shove it in your face, just pronounce it matter-of-factly and leave you feeling that yes, this is the right thing. In that spirit, then (and because I promised my friend Ch I would post this recipe oh, a month ago…), today I want to bring you one of my favorite, most dependable and well-received party snacks that just happens to also be vegan and, if you make it with the right sort of soy sauce (even Kikkoman has a GF option now! ), gluten-free as well. 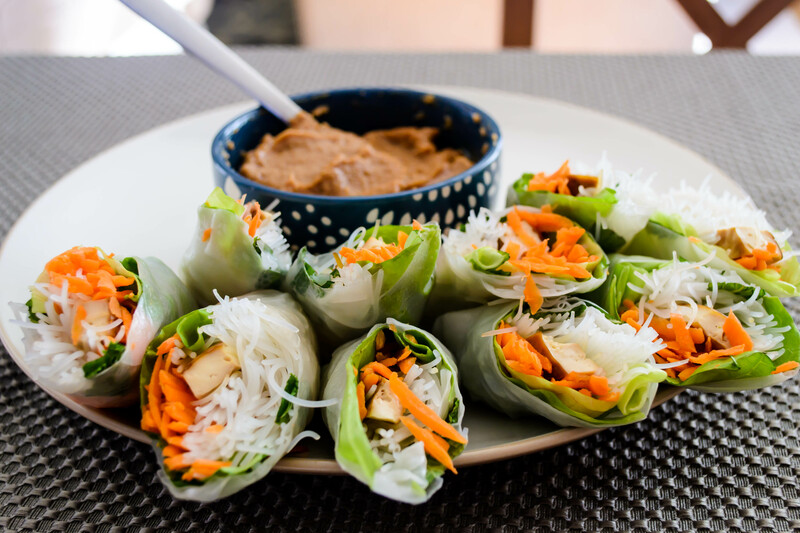 These pretty, tasty, surprisingly easy spring rolls involve shreds of bright carrot, bibb lettuce, fresh grassy mint, and rice noodles, a stick of tofu pressed, drizzled with soy sauce, and baked until meaty and firm, all lovingly wrapped in rice paper. Then, if you’re me, you whip up a quick batch of pantry-scavenged peanut sauce to dip them into, and you have something suitable for almost every meal. They aren’t totally allergen-free, because if you can’t have rice you can’t have the noodles or the wrappers these use, and if you have problems with peanuts, peanut sauce is of course out of the question. But they do manage to come close, accommodating the need to avoid animal products and that pesky gluten monster. Plus, they are fairly cheap to make, produce large quantities, and most importantly, are just plain delicious. 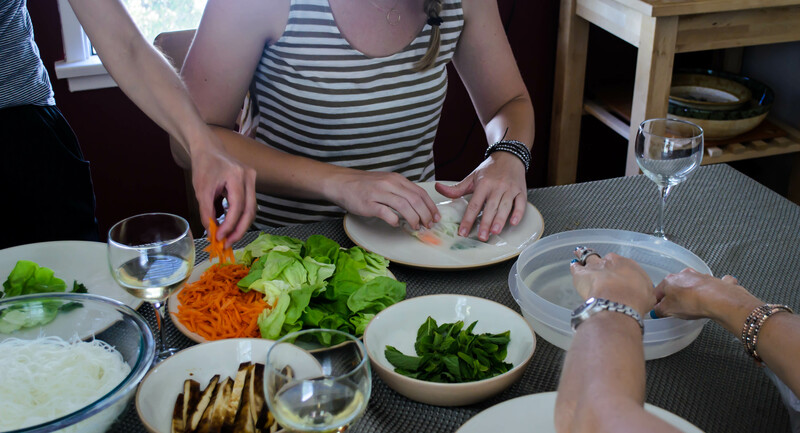 Spring rolls are a good food to take to a party, but they are also a good food to produce party style, because they can easily incorporate an assembly-line style production method. 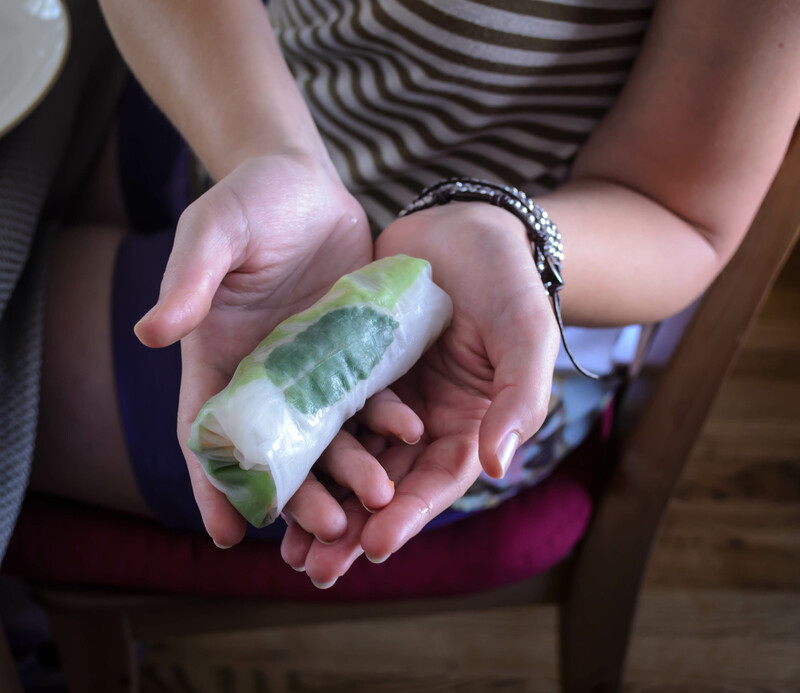 Last month, I had a few friends from work over who wanted to learn to make them, and we sat around the little table in my little “dining room” and spent the afternoon rolling, and, as you might imagine, eating, spring rolls. They kindly acquiesced, probably thanks to the free snacks and wine I was plying them with, to let me snap a few photos of the process, so that’s what you’re seeing here. Thanks, ladies! * This doesn’t, of course, guarantee 100% safe dining for people with celiac or other severe gluten intolerances, since kitchen cross-contamination is always a concern. But it is nice that for those avoiding gluten, even casually, there’s a cost-free option. Makes 18-24, depending on the width of your tofu slices. Each one then gets halved, leaving you with 36-48 snackable pieces. 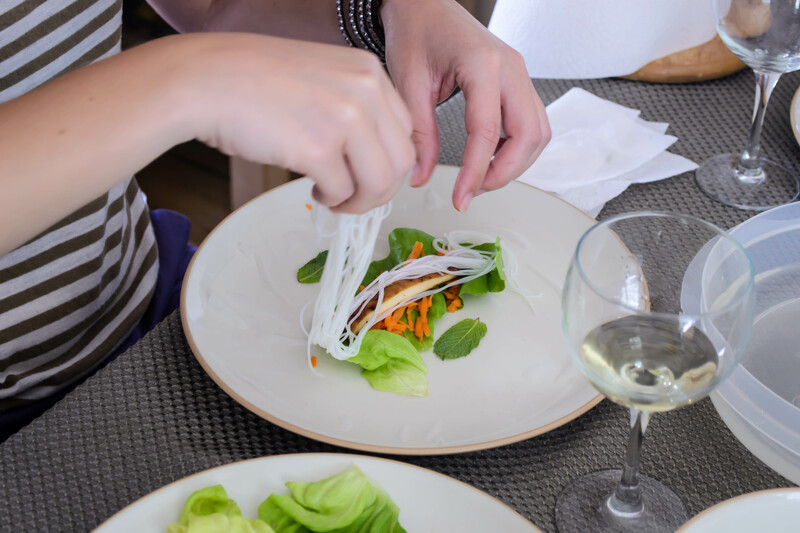 At least three hours before you want to serve your spring rolls, slice the tofu as described and press it by placing the thin squares between layers of paper towels and placing something heavy on top of them. I often use my cast iron pan for this. A baking dish weighted with cans or bottles works well too. 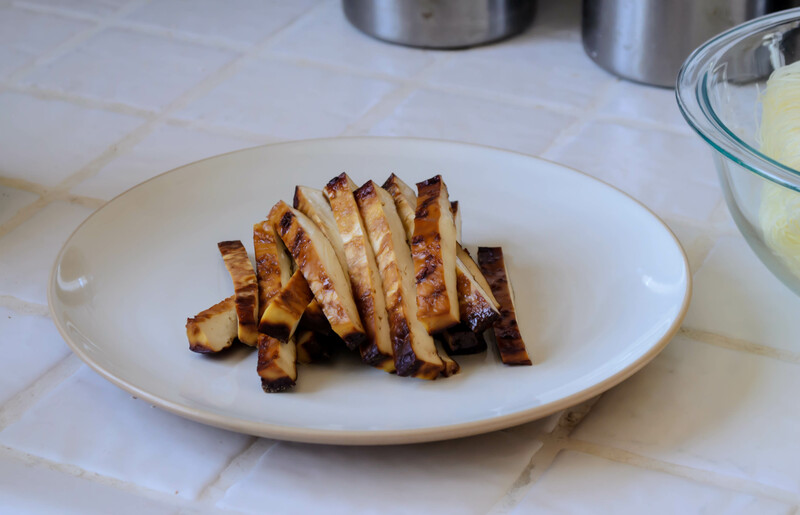 Leave the tofu to press for at least 60 minutes to squeeze out some of the water. During the last 15 minutes of pressing, preheat oven to 325F and line a baking tray with aluminum foil. Space out the tofu squares on the aluminum foil, being sure they don’t touch. Dribble each square with soy sauce to coat and bake for 60 minutes. After the first 30 minutes, dribble the top of each square with more soy sauce, as the first application will have soaked in. When they are done, the edges of the squares are deep brown, solid, and feel a bit rubbery. Remove and let cool completely, then cut into ½ inch strips (roughly index-finger-width). While tofu bakes and cools, prep the other ingredients – grating carrots, stemming mint leaves, separating lettuce leaves, etc. 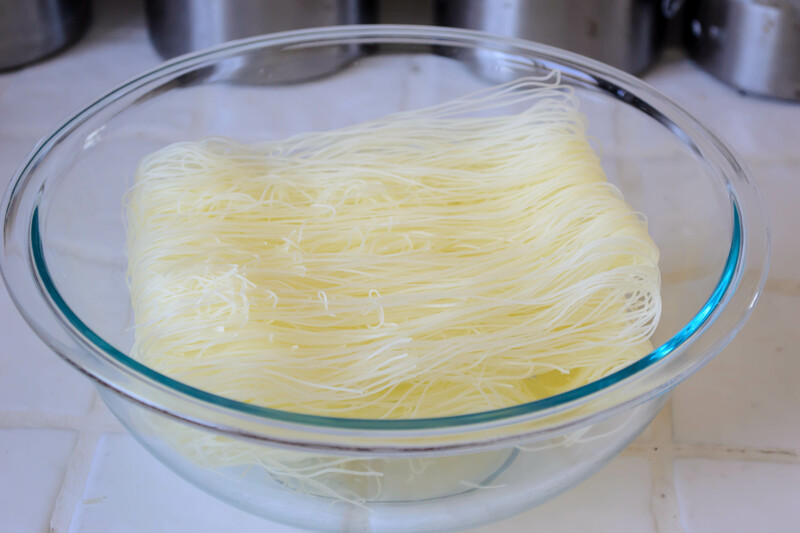 Submerge the rice noodles in hot water and let them steep for 8-10 minutes, until they feel flexible and are tender when bitten. Drain well and set aside to cool. 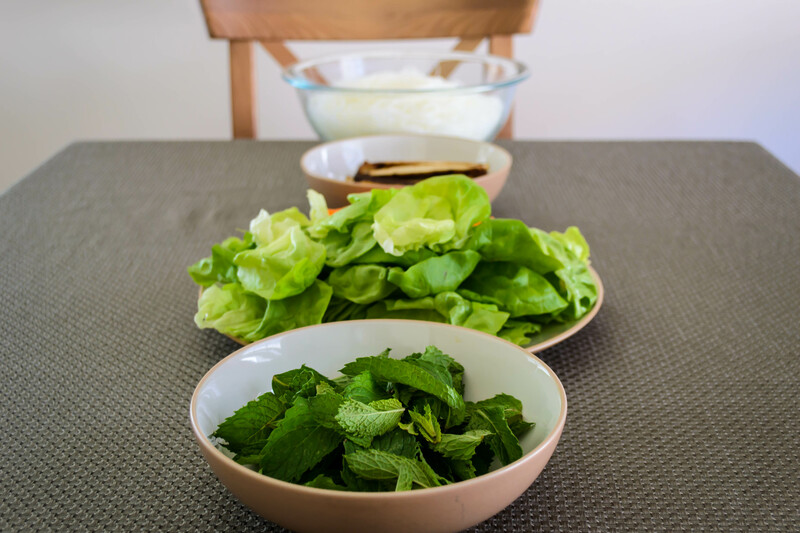 To roll, set up an assembly line – mint, then lettuce, then carrots, then tofu, then noodles. Be sure to have a plate or other vessel on which to place your finished rolls at the end of the line-up. 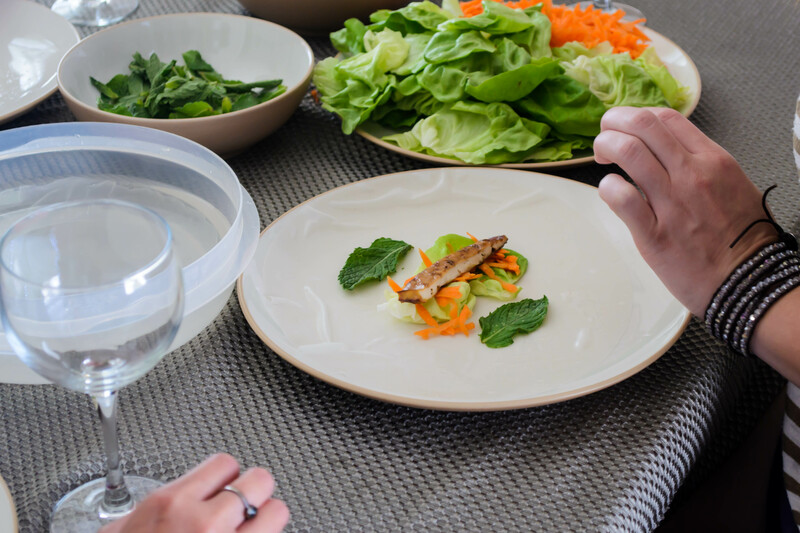 Add warm water to a wide, shallow dish or bowl that the rice paper will fit into. You will address this step first. Here we go: submerge one rice paper wrapper in the warm water and let it sit until it becomes completely pliable. I find this tends to take somewhere between 30 and 45 seconds. Place 1-3 mint leaves around the rice paper wrapper, bottom surface facing up. This ensures the top, more attractive side of the leaf will be visible through the wrapper on the finished roll. Next, place a piece of lettuce in the center of the wrapper so the longer edge of the lettuce (if there is one) faces you. Sprinkle this with grated carrots (a few teaspoons, though I always eyeball it). 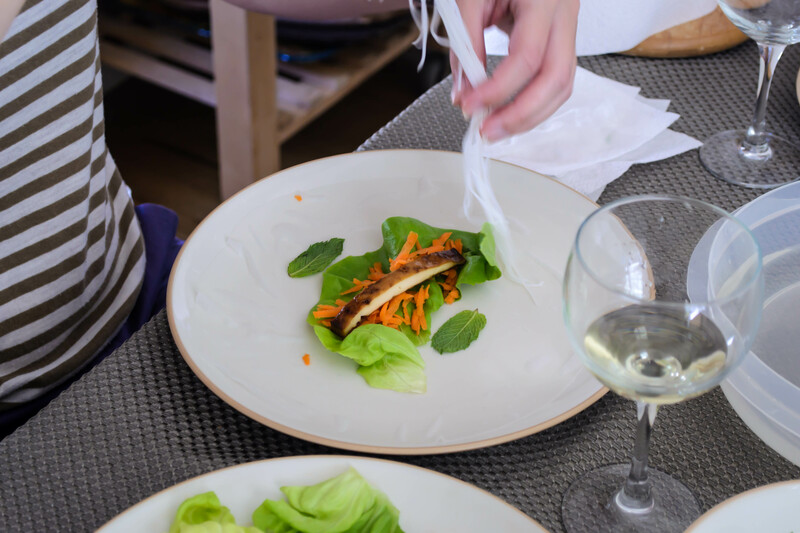 Lay a piece of tofu in the cradle of lettuce and carrots you’ve created, positioning it with the long edge facing you (so, horizontally – see photos above for reference). Top the tofu with a small pile of noodles – no more than a few tablespoons, were we picky enough to measure them out – arranging them across the tofu. Now we roll! As the wrapper faces you, fold in the left and right “edges” over the short sides of the tofu, so what you have looks like a long oval with two squared-off sides. Next, take the side of the wrapper closest to you and fold it completely over your fillings, then pull tight toward you. Roll up the wrapper, tucking each revolution tightly so the fillings are well contained. The tighter rolled, the better they will stay together. Repeat until you run out of tofu slices! You will get a nice rhythm established. I find I can complete a roll in the time it takes a new rice paper wrapper to soften. Then you are all set to start the next. Just before serving, halve each roll on the bias (with a diagonal cut) for attractive presentation. These will keep, packaged in an air-tight container in the refrigerator, for 1-3 days. 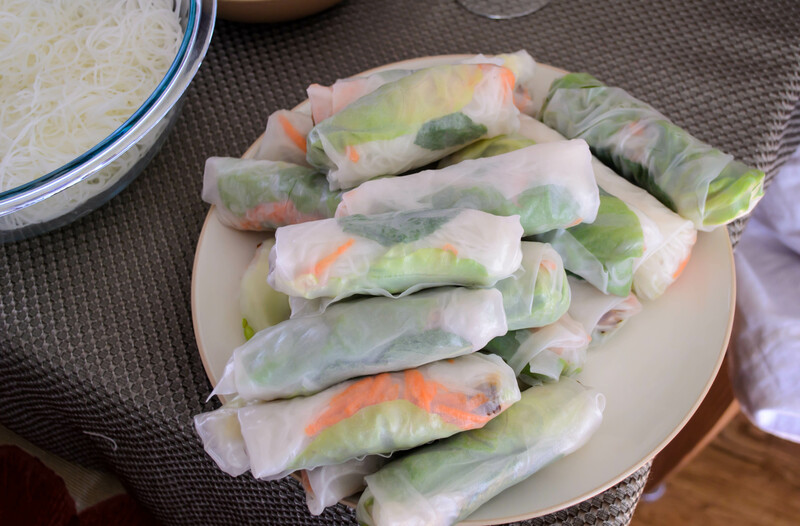 Let them come to room temperature before serving, as the rice paper is a little tough when cold. In a small saucepan, combine all ingredients over medium low heat. Stir gently with a small spatula or a spoon. As the ingredients melt together, at first the mixture will look watery and very grainy. Keep stirring gently, and it will smooth and thicken to an almost-pourable texture. Taste for seasoning. If it is too salty, add an additional tablespoon each of peanut butter and water. If it is not spicy or salty enough, add more sriracha, soy, or ginger as needed. As it cools, the peanut sauce will separate slightly. Stir vigorously to re-combine. It’s a classic children’s game. Climb a ladder: advance! Land on a snake: tumble backwards. And so it goes with most ventures. Last week newness delighted me. This week I’m plodding a bit, experiencing not setbacks, exactly, but settling for lackluster(ness?)(ocity?). I’m discovering things I don’t love about my syllabus. I’m wading through class prep. Students are still (still! The third week is about to start! Papers will be due soon!) adding my classes, which means I am overenrolled and there are new faces every day. And though I’m mostly inspired in my kitchen, not every dish is a triumph. Some slip a little. Some slither into lackluster. But it’s our job, as cooks, as experimenters, as eaters, as humans – and pardon me while I get a bit metaphorical – it’s our job to take this as a challenge. Make it work, as Tim Gunn continually reminds us. So we squirm ourselves around and push back toward the ladders. And sometimes, even after a devastating slide, we climb a few steps. I dropped the carrot and daikon sticks into a big pot of boiling, salted water and let them cook for 2-3 minutes, until they had give between my teeth but still put up a bit of resistance. I plunged them into ice water and put the tailed green beans into the boil. This was the point at which I ran into trouble. 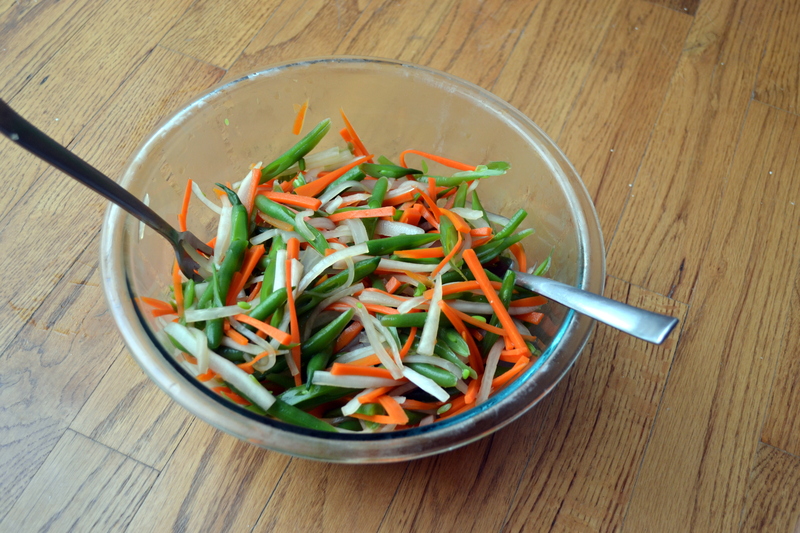 Performing a nice julienne on a pile of veg takes some time and some patience, and on this particular day I lacked both. 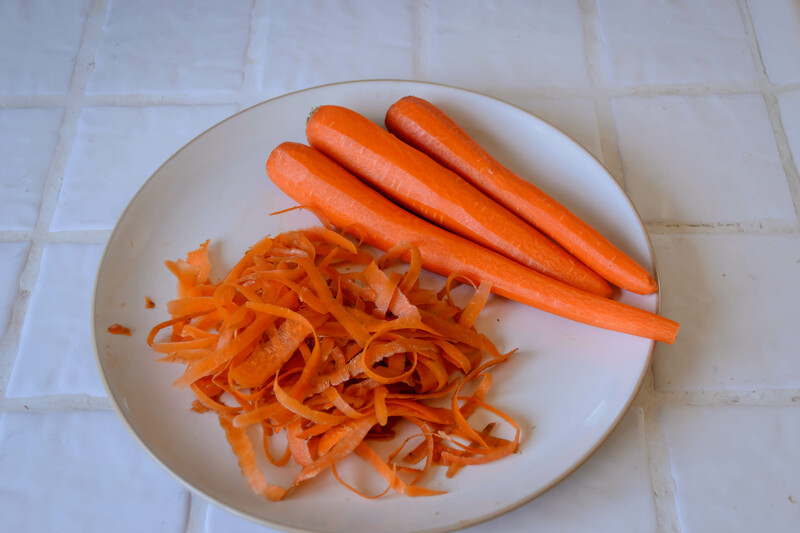 Nevertheless, cut each thick stick of carrot and daikon into thin slices (Food Network calls them panels), then turn those slices to cut long, thin vertical strips. You want uniformity but also thinness, since these are only partially cooked, and you want even quantities of carrot slivers and daikon slivers. At this point the green beans were overboiled and the sausages – the other component of our meal – were almost done on the grill, so I shifted into I-don’t-care-how-it-comes-out-just-get-it-done overdrive. It happens. You should julienne the green beans. I just sliced them into strange vertical halves. You should chill the whole salad until nice and crisp – probably at least half an hour – after lovingly tossing the thin sticks of orange, white and green together. I shoved the bowl in the freezer for five minutes while I made the dressing. I whisked the soy, honey, and lemon together and was satisfied with the flavor. Were I making this again, I would definitely increase the quantity of lemon juice and maybe even add some zest, but I say it’s up to you. Play with the combination until you like the ratios. Dressed, the vegetables had a pleasant texture and tasted well seasoned, but the salad as a dish was missing something. N. and I agreed that the dressing was a little one-note, and that note was soy sauce. Flavorwise, things were also a bit on the dull side. Red pepper flakes or raw garlic, we decided, or more or different acid, would have helped things along. Maybe some chives or lemongrass or ginger or cilantro, and certainly pairing this Asian-flavored dressing with something other than Italian sausages, would have been the right move. And so, in my attempts to slither back into success, I considered the leftovers. They weren’t stars, but they could perhaps be supporting players. In fact, though they were not the traditional combination, they seemed not so different from the vegetables that go into a bahn mi sandwich. Setting off to work a morning or two later, therefore, I slathered a crisp roll with mayonnaise, piled up a good portion of drained veggie slivers and, lacking lunchmeat, topped the whole thing with slices of pepperjack cheese. I know. Cheese is not part of bahn mi either. But jalapeño slices usually are, and the vegetables were crying for spice anyway. It wasn’t the best sandwich I’ve ever had. But it wasn’t a disaster either. It was a few steps forward. Keep moving forward. On to the next ladder! Big news, oh friends: come July, N. and I are moving. We’re leaving Eugene, OR and heading south for Los Angeles, where N. landed a great job. I’m sad about this, of course. I love Eugene. I love its beauty, and I’ve made some of the best friends and eaten some of the best food of my life here. I don’t love the way the weather lately has been playing winter/spring/winter/spring/summer/winter on us, and I’m terrified it will pour on graduation day in a week or so. But mostly I love it. Yet this move presents the potential for plenty of new delights. LA is a foodie paradise. A quick search on Yelp for our new area revealed restaurants serving every kind of food I could possibly crave, and some I’ve never tried before. Ethiopian will be new to me, as will Caribbean (outside of the ubiquitous and usually inauthentic jerk [insert your protein of choice here]). The idea of being back in a place with excellent Chinese and Mexican food is overwhelming. But it’s not just restaurant food that I’m looking forward to. The Willamette Valley in Oregon boasts great growing conditions for lots of foods, including berries of all kinds, hazelnuts, and plenty of local produce. But Southern California has so much, given its balmy temperatures year round, that buying and eating local food will suddenly become much easier – not even from farmers’ markets and farm stands, but even from the grocery store. Avocados, citrus, grapes, all no longer destroy the locavore dream. Even the backyard of the house we will be moving into has a lemon tree. A lemon tree! This excites me almost more than anything else about the whole situation! Our upcoming relocation also presents a challenge. N. and I have lived in our current home for four years. We have lived in Eugene for six. Over that much time, things accumulate. Not just house things, like forgotten books and extra sweaters and skillets I shoved in the back of that cabinet N. hates when I replaced them with Circulon non-stick wonders. Food things. 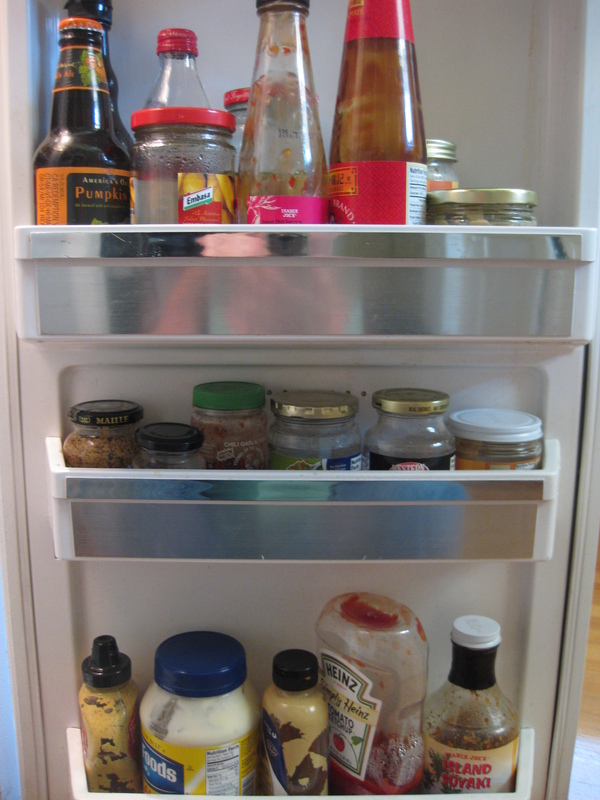 We have so many half-empty jars of condiments. So many bags of frozen vegetables bought on a buy-one-get-one sale. Blackberries from last summer and cranberries from Thanksgiving, carefully preserved on the shelves of my freezer. 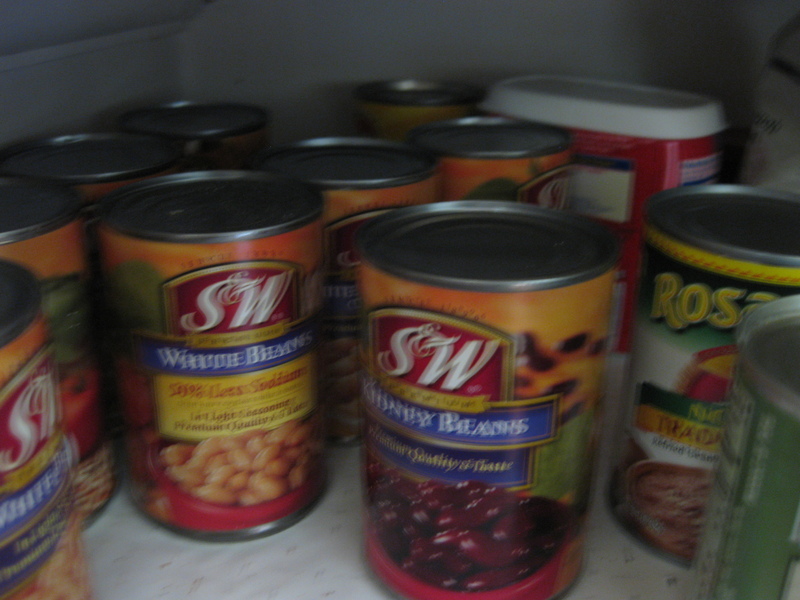 Canisters of rice, and brown rice, and millet, and dried beans, and barley, and noodles in the pantry. It’s a lot of stuff. So here comes the challenge: interspersed with regular food posts and wedding cupcake practice and the occasional, still-kicking-because-I-can’t-bear-to-abandon-it Bittman dish, I will be instituting a new project. I’m calling it “Emptying the Fridge.” Each week when I make our menu plan, I’m going to try to incorporate at least one dish that requires the remnants – or a good quantity – of at least one refrigerator, freezer, or pantry item. I’m not talking about things we use all the time, like yogurt or bread or eggs. I’m talking about the minimal use items, like anchovy paste, or capers, or champagne honey mustard, or chili garlic paste. 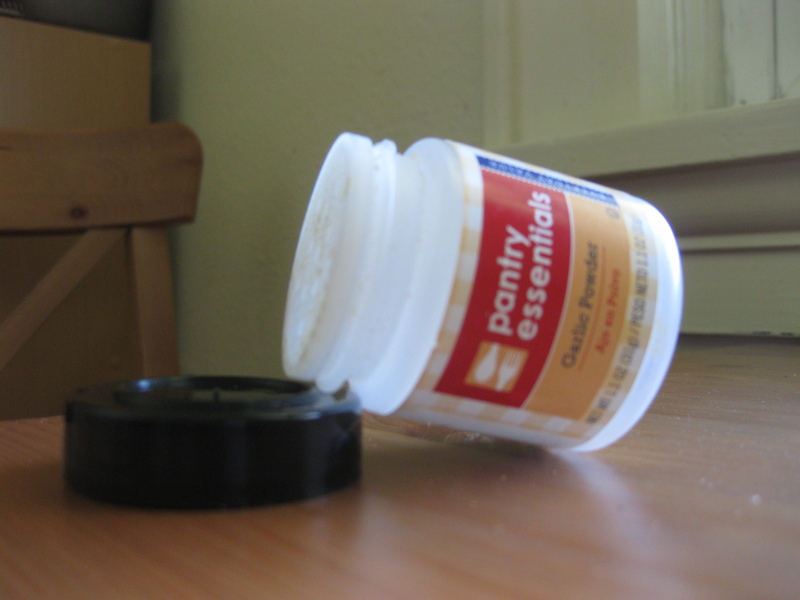 This week, I have plans for several items, and though I may not eliminate them, I will at least make a dent in several jars. After a barbeque a few weeks ago featuring a peanut noodle side dish, I decided I want to make Ina Garten’s Szechuan Noodles. 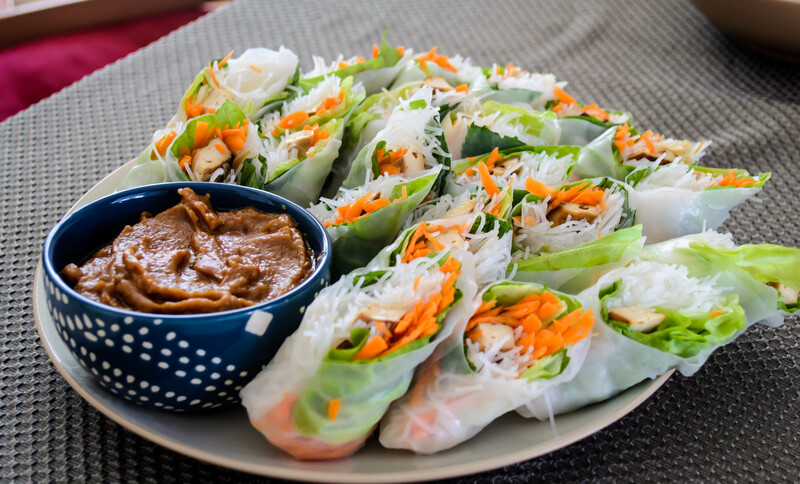 This requires a whole cadre of ingredients including peanut butter, soy sauce, rice vinegar, and various vegetables. It also, of importance to this project, requires hot chili sauce and tahini. Both of these items currently languish on my refrigerator door, awaiting stir-fries and hummus. But this week, they will shine and diminish simultaneously. Other plans include a white bean puree I will invent (and post the recipe for, if it turns out well) to work on using up the four cans (four? How can I possibly have four?) of white beans in my pantry, and peanut butter energy bars, which will help eliminate the giant canister of oats I’ve gotten too stubborn to turn into oatmeal. At a certain point, you have to eat like it’s summer, even if the sky says it isn’t, don’t you? But snack bars are a worthy and not-un-spring-like application. This project is, I think, a combination of homestyle Iron Chef and Chopped. Not only are there feature or star ingredients, but after a while the pairings of available options will become unusual and require a certain amount of ingenuity to use up. I like this, because it prepares me for the Food Network show I will never have, which I would call “Empty Fridge.” EF would consist of me trying to use limited pantry and refrigerator items to create something delicious without having to make an extra trip to the store, so in essence it’s Chopped-at-Home. The difference with my current project, though, is that I am not prohibited from shopping, and am in fact planning ahead based on the contents of my condiment collection to determine our dinners.